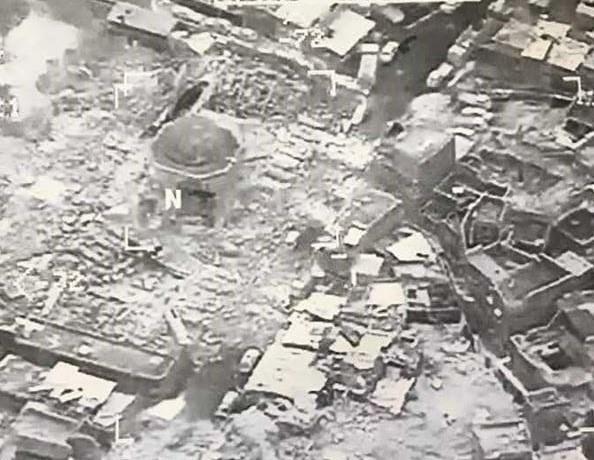 IRBIL, Iraq -- The Islamic State of Iraq and Syria (ISIS) destroyed Mosul's al-Nuri mosque and its iconic leaning minaret known as al-Hadba when fighters detonated explosives inside the structures Wednesday night, Iraq's Ministry of Defense said. The mosque -- also known as Mosul's Great Mosque -- is where ISIS leader Abu Bakr al-Baghdadi declared a so-called Islamic caliphate in 2014 shortly after the city was overrun by the militants and was seen as a key symbolic prize in the fight for Iraq's second largest city. The minaret that leaned like Italy's Tower of Pisa stood for more than 840 years. In a statement posted online after the Ministry of Defense statement, ISIS claimed an airstrike carried out by the United States destroyed the mosque and minaret. The SITE intelligence group has confirmed that ISIS' Amaq news agency released the statement. The U.S.-led coalition rejected the ISIS' claim. A coalition spokesman, U.S. Army Col. Ryan Dillon, told The Associated Press that coalition aerial surveillance confirmed the mosque was destroyed, but he said a U.S. strike was not the cause. "We did not conduct strikes in that area at that time," Dillon said. ISIS fighters initially attempted to destroy the minaret in July 2014. The militants said the structure contradicted their fundamentalist interpretation of Islam, but Mosul residents converged on the area and formed a human chain to protect it. ISIS demolished dozens of historic and archaeological sites in and around Mosul, saying they promoted idolatry. "This is a crime against the people of Mosul and all of Iraq, and is an example of why this brutal organization must be annihilated," U.S. Maj. Gen. Joseph Martin, the commander of coalition ground forces in Iraq, said in a written statement. "The responsibility of this devastation is laid firmly at the doorstep of ISIS, and we continue to support our Iraqi partners as they bring these terrorists to justice," he added. "However, the battle for the liberation of Mosul is not yet complete, and we remain focused on supporting the ISF [Iraqi Security Forces] with that objective in mind." The mosque sat on the southern edge of the Old City, the last ISIS stronghold inside Mosul. Iraqi forces launched a push into the Old City earlier this week, but have made slow progress as the last ISIS fighters there are holed up with an estimated 100,000 civilians according to the United Nations. Earlier this month Mosul residents reported ISIS fighters began sealing off the area around the mosque. Residents said ISIS fighters ordered families living in the area to evacuate in preparation for a final stand. The fight to retake Mosul was launched more than eight months ago and has displaced more than 850,000 people. While Iraqi forces have experienced periods of swift gains, combat inside the city has been grueling and deadly for both Iraqi forces and civilians. This year's Earth Day theme is "Protect Our Species." Climate change is putting millions of species at risk of extinction, and others are being forced to migrate to other habitats. Last October, the CBSN Originals team investigated invasive species, which occurs when non-native organisms enter an ecosystem and cause harm. There are thousands of invasive species in the U.S., some caused by human activity and others by climate change. CBSN Originals supervising producer Matt Morrison joined CBSN to discuss the growing problem. SpaceX is investigating an engine test failure involving one of its Crew Dragon capsules at Cape Canaveral, Florida. CBS News space consultant Bill Harwood joined CBSN to discuss the mishap and what it could mean for SpaceX's plans to launch astronauts into space later this year. Ryan Grim, Washington bureau chief at The Intercept, joined CBSN to discuss what Democrats are considering when it comes to impeachment following the release of the Mueller report.